Latimer Dental Arts is a leading provider of dental services in the Houston community. Our mission is to help you achieve and maintain a beautiful smile, and more, for years to come. Latimer Dental Arts provides healthy smiles with an artistic touch. Our office is different from most traditional dental offices. We offer state-of-the-art dentistry in a friendly and relaxing setting. 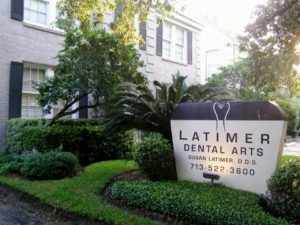 Dr. Latimer and her experienced staff offer personalized dental services conveniently located near Houston’s West University and Museum District neighborhoods. Our mission is to form relationships and provide exceptional dentistry, so we not only improve smiles, but facilitate total wellness and thereby change lives!